Look out! 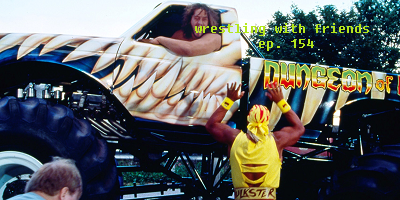 This episode's coming at you like a monster truck from HELL! Ha ha, just kidding. But you should've seen the look on your face! Nah, this is just another Judy Bagwell Awards show, featuring the Giant vs. Hulk Hogan in a monster truck sumo match vs. some segment that sounds oddly familiar. Can you help us figure it out? WWE is one of the most watched shows of my childhood but even when they used to say “don’t try this at home” we still used to. Anyways, it used to be real fun!